What’s a quit? Under California’s wage payment laws, employers must pay final wages to employees who quit within 72 hours, unless employees give 72 hours’ notice, in which case final wages are due on their last day of work. Employers that willfully pay final wages late are liable for up to 30 days of penalty wages, in addition to final wages. An employee who was retiring gave 72 hours’ notice of her intention to retire. She then sued her employer for penalty wages when it didn’t pay all of her final wages on her last day of work. Employer: No penalty wages are due, because retiring isn’t the same as quitting. A state trial court agreed that quitting and retiring aren’t the same and ruled in the employer’s favor. An appellate court reversed, so the employer appealed to the state’s highest court. The California Supreme Court, noting that wage payment laws must be interpreted broadly to protect employees, upheld the appellate court’s decision. California Supreme Court: While state law doesn’t define the word “quit,” the dictionary defines it as leaving one’s employment, which certainly applies to retirees. The court also pointed out that if the state legislature wanted an exception from the final pay laws for employees who were retiring, it would have written one into those laws. The employer, therefore, was on the hook for penalty wages. Tax treatment of penalty wages. The IRS has concluded that penalty wages are taxable to employees, but not subject to withholding. Reason: Penalty wages are imposed under state law due to an employer’s actions (or inactions) with respect to a final paycheck; they’re not payment for services rendered. The IRS has also concluded that since penalty wages are similar to liquidated damages that are payable under the Fair Labor Standards Act, they should be reported in Box 3 of Form 1099-MISC, not in Box 1 of the employee’s W-2. STATE LAW CHECKUP: California isn’t the only state that requires you to pay penalty wages in addition to regular wages. Some states require you to pay penalty wages to current and terminating employees; others limit them to terminating employees. 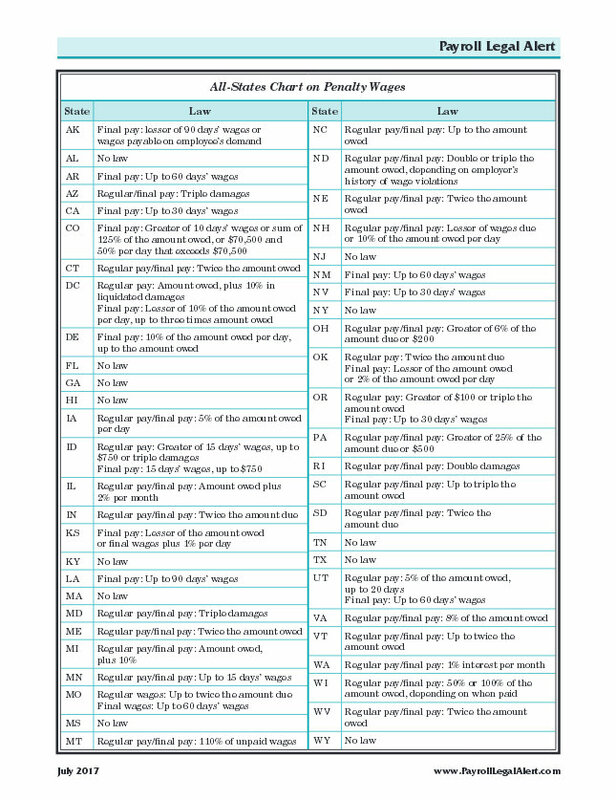 To help you get a handle on this area of state wage payment laws, the chart linked below summarizes states’ penalty wage provisions. To get the full story, visit your state labor department’s website. Click the chart image to download.